On the move again, but only round the corner to Cape Town. Round the corner being 68 miles, so it took most of the day on Friday. For those that don't know, Friday is not a good day to go and we have always avoided it since we tried it off northern Spain in 2008 and had to turn back due to one of the worst thunder and lightning storms we've ever experienced. But last Friday looked the best day by far with low swell and light winds so we decided to put superstition to one side and risk it. So it was with a certain amount of trepidation that we left at 06.30. I did feel uneasy the whole way and despite arriving about 17.00 with no significant issues, we won't rush to do it again! The winds were very fickle and we ended up motor-sailing the whole way. 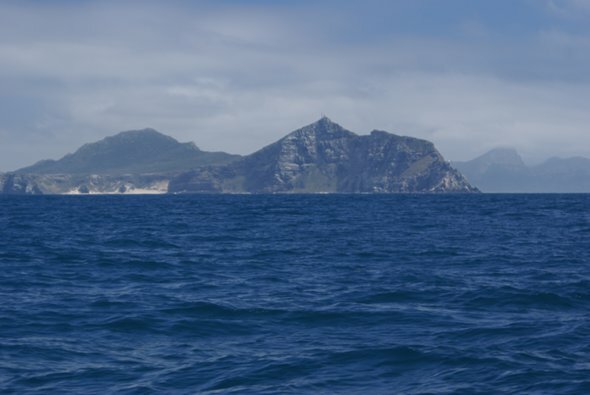 Getting out of False Bay was never going to be easy with wind from the south which normally creates quite a short sharp swell, but with light winds it wasn't that bad and we went relatively close to the Capes. To ensure the Google Earth picture on the blog shows us going round the capes rather than across them, the passage has to have 4 separate entries, this being the first. the new one is much lower down on the lower ridge to the right.